This book provides a broad survey of models and efficient algorithms for Nonnegative Matrix Factorization (NMF). This includes NMF’s various extensions and modifications, especially Nonnegative Tensor Factorizations (NTF) and Nonnegative Tucker Decompositions (NTD). NMF/NTF and their extensions are increasingly used as tools in signal and image processing, and data analysis, having garnered interest due to their capability to provide new insights and relevant information about the complex latent relationships in experimental data sets. It is suggested that NMF can provide meaningful components with physical interpretations; for example, in bioinformatics, NMF and its extensions have been successfully applied to gene expression, sequence analysis, the functional characterization of genes, clustering and text mining. As such, the authors focus on the algorithms that are most useful in practice, looking at the fastest, most robust, and suitable for large-scale models. Acts as a single source reference guide to NMF, collating information that is widely dispersed in current literature, including the authors’ own recently developed techniques in the subject area. Uses generalized cost functions such as Bregman, Alpha and Beta divergences, to present practical implementations of several types of robust algorithms, in particular Multiplicative, Alternating Least Squares, Projected Gradient and Quasi Newton algorithms. Provides a comparative analysis of the different methods in order to identify approximation error and complexity. Includes pseudo codes and optimized MATLAB source codes for almost all algorithms presented in the book. 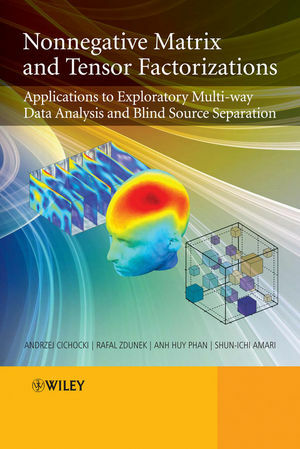 The increasing interest in nonnegative matrix and tensor factorizations, as well as decompositions and sparse representation of data, will ensure that this book is essential reading for engineers, scientists, researchers, industry practitioners and graduate students across signal and image processing; neuroscience; data mining and data analysis; computer science; bioinformatics; speech processing; biomedical engineering; and multimedia. Professor Cichocki is head of the Laboratory for Advanced Brain Signal Processing. He has co-authored more than one hundred technical papers, and is the author of three previous books of which two are published by Wiley. His most recent book is Adaptive Blind Signal and Image Processing with Professor Shun-ichi Amari (Wiley, 2002). He is Editor-in-Chief of International Journal Computational Intelligence and Neuroscience and Associate Editor of IEEE Transactions on Neural Networks. Professor Amari is head of the Laboratory for Mathematical Neuroscience, as well as vice-president of the Riken Brain Science Institute. He serves on editorial boards for numerous journals including Applied Intelligence, Journal of Mathematical Systems and Control and Annals of Institute of Statistical Mathematics. He is the co-author of three books, and more than three hundred technical papers. Associate Professor Zdunek is currently a lecturer at the Wroclaw University of Technology, Poland and up until recently was a visiting research scientist at the Riken Brain Science Institute. He is a member of the IEEE: Signal Processing Society, Communications Society and a member of the Society of Polish Electrical Engineers. Dr Zdunek has guest co-edited with Professor Cichocki amongst others, a special issue on Advances in Non-negative Matrix and Tensor Factorization in the journal, Computational Intelligence and Neuroscience (published May 08). Anh Huy Phan is a researcher at the Laboratory for Advanced Brian Signal Processing at the Riken Brain Science Institute. Glossary of Symbols and Abbreviations. 1 Introduction – Problem Statements and Models. 1.1 Blind Source Separation and Linear Generalized Component Analysis. 1.2 Matrix Factorization Models with Nonnegativity and Sparsity Constraints. 1.2.1 Why Nonnegativity and Sparsity Constraints? 1.2.5 Semi-NMF and Nonnegative Factorization of Arbitrary Matrix. 1.2.7 NMF with Offset (Affine NMF). 1.2.10 Projective and Convex NMF. 1.3 Basic Approaches to Estimate Parameters of Standard NMF. 1.3.2 Non-uniqueness of NMF and Techniques to Alleviate the Ambiguity Problem. 1.4 Tensor Properties and Basis of Tensor Algebra. 1.4.1 Tensors (Multi-way Arrays) – Preliminaries. 1.4.2 Subarrays, Tubes and Slices. 1.4.5 Outer, Kronecker, Khatri-Rao and Hadamard Products. 1.4.6 Mode-n Multiplication of Tensor by Matrix and Tensor by Vector, Contracted Tensor Product. 1.4.7 Special Forms of Tensors. 1.5 Tensor Decompositions and Factorizations. 1.5.1 Why Multi-way Array Decompositions and Factorizations? 1.5.2 PARAFAC and Nonnegative Tensor Factorization. 1.5.5 Individual Differences in Scaling (INDSCAL) and Implicit Slice Canonical Decomposition Model (IMCAND). 1.5.6 Shifted PARAFAC and Convolutive NTF. 1.5.10 PARATUCK2 and DEDICOM Models. 2 Similarity Measures and Generalized Divergences. 2.1 Error-induced Distance and Robust Regression Techniques. 2.8 Divergences Derived from Tsallis and Rényi Entropy. 3 Multiplicative Iterative Algorithms for NMF with Sparsity Constraints. 3.1 Extended ISRA and EMML Algorithms: Regularization and Sparsity. 3.1.1 Multiplicative NMF Algorithms Based on the Squared Euclidean Distance. 3.1.2 Multiplicative NMF Algorithms Based on Kullback-Leibler I-Divergence. 3.2 Multiplicative Algorithms Based on Alpha-Divergence. 3.2.1 Multiplicative Alpha NMF Algorithm. 3.2.2 Generalized Multiplicative Alpha NMF Algorithms. 3.3 Alternating SMART: Simultaneous Multiplicative Algebraic Reconstruction Technique. 3.4 Multiplicative NMF Algorithms Based on Beta-Divergence. 3.4.1 Multiplicative Beta NMF Algorithm. 3.4.2 Multiplicative Algorithm Based on the Itakura-Saito Distance. 3.4.3 Generalized Multiplicative Beta Algorithm for NMF. 3.5 Algorithms for Semi-orthogonal NMF and Orthogonal Three-Factor NMF. 3.6 Multiplicative Algorithms for Affine NMF. 3.7 Multiplicative Algorithms for Convolutive NMF. 3.7.1 Multiplicative Algorithm for Convolutive NMF Based on Alpha-Divergence. 3.7.2 Multiplicative Algorithm for Convolutive NMF Based on Beta-Divergence. 3.7.3 Efficient Implementation of CNMF Algorithm. 3.8 Simulation Examples for Standard NMF. 3.9 Examples for Affine NMF. 3.10 Music Analysis and Decomposition Using Convolutive NMF. 4 Alternating Least Squares and Related Algorithms for NMF and SCA Problems. 4.1.1 Multiple Linear Regression – Vectorized Version of ALS Update Formulas. 4.2 Methods for Improving Performance and Convergence Speed of ALS Algorithms. 4.2.1 ALS Algorithm for Very Large-scale NMF. 4.2.2 ALS Algorithm with Line-Search. 4.2.3 Acceleration of ALS Algorithm via Simple Regularization. 4.3 ALS Algorithm with Flexible and Generalized Regularization Terms. 4.3.1 ALS with Tikhonov Type Regularization Terms. 4.3.2 ALS Algorithms with Sparsity Control and Decorrelation. 4.4 Combined Generalized Regularized ALS Algorithms. 4.5 Wang-Hancewicz Modified ALS Algorithm. 4.6 Implementation of Regularized ALS Algorithms for NMF. 4.7 HALS Algorithm and its Extensions. 4.7.1 Projected Gradient Local Hierarchical Alternating Least Squares (HALS) Algorithm. 4.7.2 Extensions and Implementations of the HALS Algorithm. 4.7.3 Fast HALS NMF Algorithm for Large-scale Problems. 4.7.4 HALS NMF Algorithm with Sparsity, Smoothness and Uncorrelatedness Constraints. 4.7.5 HALS Algorithm for Sparse Component Analysis and Flexible Component Analysis. 4.7.6 Simplified HALS Algorithm for Distributed and Multi-task Compressed Sensing. 4.7.8 Generalized HALS Algorithms Using Alpha-Divergence. 4.7.9 Generalized HALS Algorithms Using Beta-Divergence. 4.8.1 Underdetermined Blind Source Separation Examples. 4.8.2 NMF with Sparseness, Orthogonality and Smoothness Constraints. 4.8.3 Simulations for Large-scale NMF. 4.8.4 Illustrative Examples for Compressed Sensing. 5.1 Oblique Projected Landweber (OPL) Method. 5.2 Lin’s Projected Gradient (LPG) Algorithm with Armijo Rule. 5.3 Barzilai-Borwein Gradient Projection for Sparse Reconstruction (GPSR-BB). 5.4 Projected Sequential Subspace Optimization (PSESOP). 5.5 Interior Point Gradient (IPG) Algorithm. 5.6 Interior Point Newton (IPN) Algorithm. 5.7 Regularized Minimal Residual Norm Steepest Descent Algorithm (RMRNSD). 5.8 Sequential Coordinate-Wise Algorithm (SCWA). 6 Quasi-Newton Algorithms for Nonnegative Matrix Factorization. 6.1.1 Projected Quasi-Newton for Frobenius Norm. 6.1.2 Projected Quasi-Newton for Alpha-Divergence. 6.1.3 Projected Quasi-Newton for Beta-Divergence. 6.2 Gradient Projection Conjugate Gradient. 6.4 NMF with Quadratic Programming. 7 Multi-Way Array (Tensor) Factorizations and Decompositions. 7.1 Learning Rules for the Extended Three-way NTF1 Problem. 7.1.1 Basic Approaches for the Extended NTF1 Model. 7.1.2 ALS Algorithms for NTF1. 7.1.3 Multiplicative Alpha and Beta Algorithms for the NTF1 Model. 7.2 Algorithms for Three-way Standard and Super Symmetric Nonnegative Tensor Factorization. 7.2.1 Multiplicative NTF Algorithms Based on Alpha- and Beta-Divergences. 7.2.2 Simple Alternative Approaches for NTF and SSNTF. 7.3 Nonnegative Tensor Factorizations for Higher-Order Arrays. 7.3.3 Fast HALS NTF Algorithm Using Squared Euclidean Distance. 7.3.4 Generalized HALS NTF Algorithms Using Alpha- and Beta-Divergences. 7.3.5 Tensor Factorization with Additional Constraints. 7.4 Algorithms for Nonnegative and Semi-Nonnegative Tucker Decompositions. 7.4.1 Higher Order SVD (HOSVD) and Higher Order Orthogonal Iteration (HOOI) Algorithms. 7.4.2 ALS Algorithm for Nonnegative Tucker Decomposition. 7.4.3 HOSVD, HOOI and ALS Algorithms as Initialization Tools for Nonnegative Tensor Decomposition. 7.4.4 Multiplicative Alpha Algorithms for Nonnegative Tucker Decomposition. 7.4.6 Local ALS Algorithms for Nonnegative TUCKER Decompositions. 7.5.1 Multiplicative Algorithms for NBOD. 7.6 Multi-level Nonnegative Tensor Decomposition - High Accuracy Compression and Approximation. 7.7 Simulations and Illustrative Examples. 7.7.1 Experiments for Nonnegative Tensor Factorizations. 7.7.2 Experiments for Nonnegative Tucker Decomposition. 7.7.3 Experiments for Nonnegative Block-Oriented Decomposition. 7.7.4 Multi-Way Analysis of High Density Array EEG – Classification of Event Related Potentials. 7.7.5 Application of Tensor Decompositions in Brain Computer Interface – Classification of Motor Imagery Tasks. 7.7.6 Image and Video Applications. 8.1.2 NMF vs. Spectral Clustering. 8.1.3 Clustering with Convex NMF. 8.1.4 Application of NMF to Text Mining. 8.4 Application of NMF for Analyzing Microarray Data. 8.4.2 Analysis of Time Course Microarray Data.